As a special feature on last year’s opening day of the New Haven Municipal Swimming Pool, an 18-foot water slide was rented. 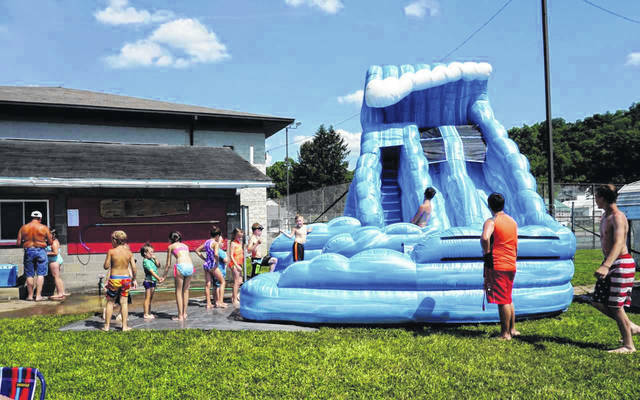 The town is currently in the midst of a fundraising campaign to provide free admission to the pool for the upcoming summer season. NEW HAVEN — With about six weeks remaining in their spring fundraising effort, members of the New Haven Swimming Pool committee are nearly halfway to their goal. At their most recent meeting, the committee reported a little over $4,000 has been collected so far. The goal, in order to offer free swimming for a second year, is $10,000. Attending the meeting were Mayor Greg Kaylor, Recreation Director Matt Shell, and members Phyllis Arthur, Cathy Zerkle, Lisa Honaker, and Lisa Crump. Shell said it is hoped that the goal will be met by May 17, when opening preparations will begin. He added the pool will be painted in the next few weeks, with funding coming from a grant through the Robert and Louise Claflin Foundation. The grant will also pay for the season’s chemicals. Members discussed that some businesses, organizations, and individuals have pledged donations, but have not yet submitted their money. They urged those who have made the pledges to follow through as soon as possible. Committee members will be collecting donations at Walmart in Mason on Friday, May 3, from 2 to 4 p.m. An account has been opened at City National Bank under “New Haven Pool Fund,” where donations can be made year round, and a donation box will be placed at the pool during the swim season. Plans were also discussed to have a bingo event in the fall to get a jumpstart on funding for the 2020 season. The committee stressed that no donation is too small. A $50 donation basically pays a season pass for a child, while $100 pays for an adult for the season. The pool is scheduled to open on Memorial Day, and remain open seven days a week until school resumes. Once school starts, the pool will be open on weekends until Labor Day. It will also be available to rent for private evening parties by contacting the town hall during business hours. Mayor Kaylor said he has also been told that the pool must have an automated external defibrillator (AED) on site. While the defibrillators are approximately $1,200, committee members expressed that they are hoping someone might donate one. It was noted the AED could be used at the community building throughout the year for roller skating, building rentals and basketball. Free swimming for everyone at the New Haven pool was first offered last year, following the establishment of the committee. Members raised funds for the free admission, and attendance raised from a daily average of 14 in 2017, to 65 in 2018. Several days last year saw over 100 people attending. With the success of free admission, however, came additional costs. This resulted in the need for even more money to be raised this year. The American Red Cross requires two lifeguards to be on duty for 10 or more swimmers, and three on duty if the number raises to 50 or above. Due to the increased number of swimmers last year, the total salary cost for the pool’s seven lifeguards doubled.